During the acute phase response, the interplay between high density lipoproteins and low density lipoproteins (LDL) favors transient generation of oxidized LDL with proinflammatory activities. We hypothesized that oxidative modification of LDL is an endogenous signal for the immune system, and we have shown that oxidized LDL promotes mature dendritic cell transition from monocyte, therefore linking the nonspecific acute phase response to adaptive immunity. Lysophosphatidylcholine (LPC) is a major lipid component of oxidized LDL with reported proinflammatory activities. We now report that LPC acts through G protein-coupled receptors on differentiating monocytes to generate mature dendritic cells with the ability to stimulate IL-2 and IFN-γ production by allogeneic T lymphocytes. LPC is most effective in lipoprotein-deprived serum and can be inhibited by an excess of native LDLs reflecting normal plasma conditions. Therefore, by controlling the balance between native and oxidized lipoproteins and the resulting production of LPC, the acute phase reactants may provide a context of Ag presentation that is transiently favorable to immune activation. Intralipid, a therapeutic lipid emulsion for parenteral nutrition with unexplained immunomodulatory properties, also blocked LPC activity. This opens perspectives for the understanding and treatment of acute and chronic inflammatory diseases. The acute phase response (APR)3 is a nonspecific physiological response of the body to injury, trauma, or infection (1). One major biologic function of APR is to improve survival of the host by activating a variety of defense-related mechanisms, such as tissue repair and limiting dispersal of pathogens before homeostasis can be restored. It is characterized by wide changes in concentration of a large number of plasma proteins called acute phase reactants (2). These modifications can be dramatic (up to 1000-fold) and are predominantly the result of alterations in the pattern of protein synthesis by the liver. Although measurement of some acute phase reactant concentration is currently used as a diagnosis and prognosis tool, relatively little is known about their function in vivo. Among other features, APR is accompanied by alterations in lipoprotein composition and is associated with oxidation of low density lipoprotein (LDL) (3, 4). Oxidative modification of LDL has been extensively studied for more than 20 years because it plays a central role in the pathogenesis of atherosclerosis (5). Epidemiologic studies have implicated infectious agents in the induction and development of atheromas, and many of the pathological features of this disease relate to dysregulated chronic inflammation. Interestingly, Chlamydia pneumoniae and chlamydial hsp60, an inflammatory Ag localized to atheromas, were found to induce cellular oxidation of LDL (6, 7). Increased levels of oxidized lipids in the serum and circulating LDL have been found in animal models of bacterial infection and inflammation (8). The host response to infection produces LDLs that not only contain more oxidized lipids but are also more susceptible to further oxidation ex vivo (8). Metabolic changes that contribute to LDL oxidation in vivo are far from being understood, but some clarification has been brought by comparative studies of high density lipoprotein (HDL) and LDL composition and function during homeostasis and APR. During homeostasis, LDL is protected from oxidative modification by HDL-associated enzymes, particularly paraoxonase, which destroys biologically active oxidized phospholipids (9). During APR, some acute phase reactants including serum amyloid A, ceruloplasmin, and apolipoprotein J transitory integrate HDL, which in turn loses its ability to control oxidation of LDL and production of oxidized phospholipids (10). Thus, homeostatic HDL maintains LDL in a noninflammatory state, whereas acute phase HDL favors the conversion of native LDL to proinflammatory oxidized LDL (oxLDL) and production of oxidized phospholipids. APR can be truly acute, as in the case of a viral or bacterial infection, but it may also become chronic and result in inflammatory diseases like atherosclerosis. By controlling the transient generation of proinflammatory oxLDL and bioactive oxidized phospholipids, APR may thus be part of a nonspecific innate immune response. We have recently shown that oxLDL promotes mature dendritic cell (DC) transition from differentiating monocytes (11), therefore supporting the hypothesis that some oxidized phospholipids generated during APR may signal the presence of a dangerous situation and favor the development of adaptive immunity. oxLDL have also been studied on various cell types on which it exerts several proinflammatory effects, which include production of monocyte chemoattractant protein-1 (12), M-CSF, and GM-CSF by endothelial cells (13), increased monocyte adhesion to and transmigration through the endothelial cell layer and lymphocyte chemotaxis (14, 15, 16). LDL is the main source of blood cholesterol in humans. It is a spherical particle of 20 nm with a hydrophobic core containing triglycerides and cholesteryl ester molecules and a surface monolayer of polar lipids (primarily phospholipids) and apolipoprotein B. Lysophosphatidylcholine (LPC) represents 1–5% of the total phosphatidylcholine content of LDL and is generated by oxidation and fragmentation of the polyunsaturated sn-2 fatty acyl residues of phosphatidylcholine, followed by the hydrolysis of the shortened fatty acyl residues by LDL-associated enzymes (17). Oxidative modification of LDL is associated with dramatic increased formation of LPC, which can reach 40–50% of the total phosphatidylcholine content (18). LPC content is also increased in circulating LDL after LPS treatment (8). LPC activates a wide range of cell types and is implicated in many aspects of the inflammatory response. It stimulates growth factor expression by endothelial cells (19, 20) and induces inflammation and leukocyte accumulation after intracutaneous injection in humans (21). LPC up-regulates adhesion molecules on endothelial cells and their production of monocyte chemoattractant protein-1 and stimulates proinflammatory cytokines synthesis (22, 23). LPC is also one of the mediators required in the cytotoxic response of human NK cells to tumor cells (24). In addition to its proinflammatory activity, LPC displays some contrasting immunoregulatory activities by binding to its high affinity receptor G2A on T cells (25). Interaction of LPC with G2A is thought to limit T cell responses by increasing the threshold of lymphocyte activation and proliferation. The effect of LPC on APCs such as DCs has not been investigated, leaving the question of its global function in the immune system open. In this paper, we asked whether the ability of oxLDL to favor monocyte-to-mature DC transition was mediated by LPC and investigated the possibility of control of this activity by native LDL and lipid nanoemulsion. LDL (1.025 ≤ d ≤ 1.055 g/ml) was isolated from human plasma of normolipidemic healthy individuals by ultracentrifugation. The density of the plasma was raised to 1.025 g/ml using NaBr. After ultracentrifugation at 100,000 rpm, 4°C for 4 h using a TL 100.4 rotor, the light fraction containing chylomycron, very low density lipoprotein, and intermediate density lipoprotein was removed. The density was adjusted at 1.055 g/ml with NaBr and, after ultracentrifugation in the same conditions, the light fraction containing LDL was collected, dialyzed extensively against 150 mM NaCl/2.4 mM EDTA pH 7.2 at 4°C, filtered at 0.45 μm and stored under nitrogen. LDL concentration was adjusted at 1 mg/ml protein by dilution in PBS and was dialyzed at 4°C against PBS to eliminate EDTA. Cu2+-mediated oxidation was conducted at 37°C for 24 h by dialysis against 5 μM CuSO4/PBS. The reaction was stopped by addition of 40 μM butylated-hydroxy-toluene and extensive dialysis at 4°C against PBS containing 100 μM diethylendiamine pentaacetic acid. The oxidation degree was assessed by malonyl-dialdehyde (MDA) production measured by the LPO-586 assay (Oxis, Portland, OR), and hydrogen peroxide content was measured by PeroxOQuant quantitative peroxide assay (Pierce, Rockford, IL). Typically, native LDL preparations contained <1.5 ± 0.3 nmol MDA/mg total protein and 230 ± 82 nmol peroxides/mg total protein. After 24 h oxidation, oxLDL contained 16.7 ± 6.6 nmol MDA/mg total protein and 896 ± 295 nmol peroxides/mg total protein. Endotoxins in LDL or oxLDL were less than 0.6 pg/ml in final concentration as assessed by E-toxate test (Sigma-Aldrich, St Quentin-Fallavier, France). A total of 400 μl of methanol was added to 100 μl of LDL or oxLDL (1 mg/ml). After mixing, 100 μl of chloroform was added and samples were vortexed. Then, 300 μl of water was added for phase separation, and samples were vortexed vigorously and centrifuged for 1 min at 9000 × g. The upper phase (defined as the aqueous phase) was collected and dried in speed vacuum. The lower phase was mixed with 300 μl of methanol and centrifuged for 2 min at 9000 × g to pellet the proteins. Supernatant (defined as the lipid phase) containing the lipophilic molecules extracted in chloroform was collected and dried in speed vacuum. Dried products of both phases were resuspended in 100 μl of 150 mM NaCl/1 mM EDTA/10 mM Tris, pH 7.4. Nanoemulsions were prepared by the solvent displacement method as described (26). 1-Palmitoyl-2-arachidonoyl-phosphatidylcholine and l-α-lysophosphatidylcholine (Sigma-Aldrich) were diluted in ethanol (100 mg in 2 ml of solvent). A total of 350 mg in 375 μl of medium chain triglycerides (Société Française des Oléagineux, St. Laurent-Blagny, France) constituting the oily core of the emulsion were added. This ethanolic solution was subsequently diluted to 15 ml with acetone. Solution was dropped to 30 ml of an aqueous solution containing 84 mg of Pluronic F68, a nonionic surfactant triblock copolymer (poly(oxyethylene)-poly(oxypropylene)-poly(oxyethylene); BASF Bioresearch, Ludwigshafen, Germany). The resulting mixture turned milky as a result of nanoemulsion formation. After stirring for 1 h, organic solvents were evaporated under reduced pressure at 40°C and the solution concentrated to 5 ml. Mean diameters of prepared emulsions and Intralipid 20% (Fresenius Kabi, Sevres, France) were determined by photon correlation spectroscopy using a Malvern Zetasizer 3000HS (Malvern Instruments, Worcs, U.K.). Composition and size of these particles are reported in Table I⇓. The protein content of LDL, Intralipid 20%, LPC, or phosphatidylcholine (PC) emulsions was estimated by Coomassie Protein MicroAssay procedure (Pierce), and lipid composition was determined using cholesterol RTU, triglycerides enzymatic PAP 150, and phospholipids enzymatic PAP 150 kits from bioMérieux SA (Marcy l’Etoile, France). PBMCs were isolated from human peripheral blood by standard density gradient centrifugation on Ficoll-Hypaque (Amersham Pharmacia Biotech, Uppsala, Sweden), and then mononuclear cells were separated from PBLs by centrifugation on a 50% Percoll solution. Monocytes were purified by immunomagnetic depletion (Dynal Biotech, Oslo, Norway) using a mixture of mAbs: anti-CD19 (4G7 hybridoma; provided by Dr. Ron Levy), anti-CD3 (OKT3; American Type Culture Collection, Manassas, VA), and anti-CD56 (NKH1; Beckman Coulter, Fullerton, CA). Recovered monocytes were >90% pure as assessed by CD14 labeling. Monocytes were differentiated to immature DCs during 6 days with 40 ng/ml human recombinant GM-CSF and 250 U/ml human recombinant IL-4 in RPMI 1640 (Life Technologies, Rockville, MD) supplemented with 2 mM glutamine (Life Technologies), 10 mM HEPES (Life Technologies), 40 ng/ml gentamicin (Life Technologies), and 10% lipoprotein-deficient serum (LPDS; Sigma-Aldrich). Differentiating monocytes were treated at day 5 by addition of lipoproteins, phospholipids, or lipid emulsions to the medium at the last day of differentiation. A total of 2 × 106 cells were treated with 10 μg/ml oxLDL or LDL (total lipoprotein), with 20 μl of lipid or aqueous phases extracted from oxLDL or LDL, or with 40 μM LPC or PC, either dissolved in ethanol or emulsified with triglycerides (LPC or PC emulsion). To block Gαi proteins, day 5 differentiating monocytes were pretreated for 3 h with 100 ng/ml pertussis toxin (PTX; Biomol, Plymouth Meeting, PA), and then the medium was changed and cells were further incubated with 40 μM LPC for 24 h as previously indicated. When mentioned, a platelet-activating factor receptor (PAFR) antagonist (BN52021; Biomol) was added 15 min before LPC. Competition experiments were performed by concomitant adjunction of oxLDL (10 μg/ml) or LPC (40 μM) with native LDL (50 μg/ml of proteins corresponding to 50 μg/ml phospholipids) or Intralipid 20% (50 μg/ml phospholipids). At the end of the differentiation (day 6), cells were harvested and analyzed. Cell viability was superior to 90%. Endotoxin contamination of LPC was excluded by lack of polymixin B (Sigma-Aldrich) inhibition. Phenotype was analyzed by flow cytometry on a FACSCalibur (BD Biosciences, Franklin Lakes, NJ) using FITC-conjugated anti-CD14, -HLA-DR, and -CD80 and PE-conjugated anti-CD1a, -CD83, -CD86, and -CD40, all from Beckman Coulter. Differentiated cells, treated or not with 40 μM LPC as described above, were harvested at day 6, resuspended in 10% FCS medium, and incubated at 37°C for 30 min with 1 mg/ml Lucifer Yellow (Sigma-Aldrich) or 1 mg/ml FITC-T70-dextran (Sigma-Aldrich) or for 3 h with carboxylate-modified yellow-green FluoSpheres of 0.45 μm (Beads; Molecular Probes, Leiden, The Netherlands). Internalization was stopped on ice with cold PBS containing 0.1% BSA and 0.05% NaN3. Cells were washed three times at 4°C in this buffer, and their content in fluorescent probe was analyzed on a FACSCalibur (BD Biosciences). Naive T lymphocytes were isolated from human peripheral blood. PBMCs were isolated by density gradient centrifugation on Ficoll-Hypaque. After depletion of monocytes on Percoll gradient, PBLs were recovered in the dense fraction. T lymphocytes were purified by immunomagnetic depletion using a mixture of mAbs: anti-CD19 (4G7), anti-CD16 (3G8), anti-CD56 (NKH1), anti-glycophorin A (11E4B7.6), and anti-CD14 (RMO52) (all from Beckman Coulter). T lymphocytes were >95% pure as assessed by CD3 labeling. Primary MLRs were conducted in 96-well flat-bottom culture plates. DCs were treated or not at day 5 with 40 μM LPC or 10 μg/ml oxLDL in presence or not of competitors as described above, collected at day 6, extensively washed, and resuspended in RPMI 1640 supplemented with 2 mM glutamine, 10 mM HEPES, 40 ng/ml gentamicin, and 10% FCS (BioMedia, Boussens, France). These cells were then cocultured with 2 × 105 allogeneic T cells in 200 μl of complete culture medium at 1:5, 1:10, or 1:20 DC:T cell ratios. After 4 days, 150 μl of culture supernatant was analyzed for the presence of IL-2 and IFN-γ using cytokine-specific ELISA kits purchased from Endogen (Woburn, MA). Total RNA was isolated using the RNeasy Mini kit (Qiagen, Courtaboeuf, France). One microgram of total RNA was reverse transcribed using the Thermoscript RT-PCR system (Life Technologies). cDNA was then used for PCR amplification of G2A receptor, PAFR, G-protein-coupled receptor 4 (GPR4), lectin-like oxLDL receptor (LOX-1), and ribosomal protein S12. The following primers were used to amplify G2A (5′-CGGTGGTTGTCATCTTCCTA-3′ and 5′-TTAGCGGCCGCTCAGCAGGACTCCTCAATCAG-3′) (27), GPR4 (5′-TAATGCTAGCGGCAACCACACGTGGGAG-3′ and 5′-TCCAGTTGTCGTGGTGCA-3′) (28), PAFR (5′-CTCGGGGTCATTGCTAATG-3′ and 5′-TTCAGTGACCGTATCCGTG-3′) (29), LOX-1 (5′-GGCTTGCTGCGACTCTAGG-3′ and 5′-AGTGGGGCATCAAAGGAG-3′) (30), and S12 (5′-GGAGGTGTAATGGACGTTA-3′ and 5′-CTGAGACTCCTTGCCATAG-3′) (29). The amplified products were analyzed by gel electrophoresis (414 bp for G2A, 258 bp for GPR4, 698 bp for PAFR, 569 bp for LOX-1, and 311 bp for S12). A total of 107 day 5 differentiating monocytes were starved for 1 h in RPMI 1640 medium without serum, containing 0.3% BSA (Sigma-Aldrich) before treatment with 40 μM LPC for 2, 5, 10, or 15 min. Cells were washed with cold PBS, and the pellet was lysed in 8 M urea/2% SDS/0.2 M Tris-HCl (pH 8.0)/100 mM DTT and boiled for 5 min. After centrifugation, the supernatant was analyzed on a 10% SDS-PAGE, and proteins were transferred on Immobilon-P (Millipore, Bedford, MA). Blots were saturated with 5% fat-free milk/TBS/0.1% Tween 20 for 1 h. Incubations with primary and secondary Abs were conducted in TBS/0.1% Tween 20/5% BSA. Anti-phospho-ERK and total-ERK were from Cell Signaling Technologies (Beverly, MA). Detection was performed using HRP-conjugated anti-mouse Ab (Amersham Pharmacia Biotech) with the ECL kit (Amersham Pharmacia Biotech). We have previously shown that the presence of oxidized LDL during monocyte differentiation to DCs yielded phenotypically and functionally mature DCs (11). Optimal reactivity of monocytes was obtained when oxLDL was added during late stages of differentiation in GM-CSF and IL-4. Direct generation of mature DCs from differentiating monocytes was best achieved when oxLDL was added at day 5 of differentiation for 24 h. We also showed that FCS containing native lipoproteins and native LDL added to LPDS were efficient inhibitors of oxLDL activity, indicating that oxLDLs are active in inflammatory conditions when the level of native LDL is reduced. Here we used the same experimental procedure to screen for bioactive molecules on differentiating monocytes cultured in LPDS to avoid inhibition by native LDL. Because strong up-regulation of CD86 is a constant feature induced by oxLDL, this marker was used as a first screening readout to determine which component of oxLDL was responsible for DC activation. Differentiating monocytes were treated for 24 h with aqueous or lipid phases from native LDL or oxLDL. The oxidation process generates various components, including oxysterols and modified phospholipids, which are concentrated in the lipid phase, whereas the aqueous phase may contain polar oxidized free fatty acids. Neither total native LDL nor phases from native LDL could induce CD86 expression (Fig. 1⇓, A–C). In contrast, lipid phase from oxLDL strongly up-regulated CD86 expression, as did total oxLDL (Fig. 1⇓, A and B). The aqueous phase from oxLDL had no effect on CD86 expression (Fig. 1⇓C). PC is the major phospholipid component of native LDL, and its derivative LPC can constitute as much as 50% of the total phospholipids of oxLDL. Therefore, the effect of both PC and LPC was tested on day 5 differentiating monocytes. PC and LPC were also emulsified with triglycerides to form particles of 300–400 nm constituted of triglycerides covered with a monolayer of PC or LPC. Composition of these emulsions is shown in Table I⇑. 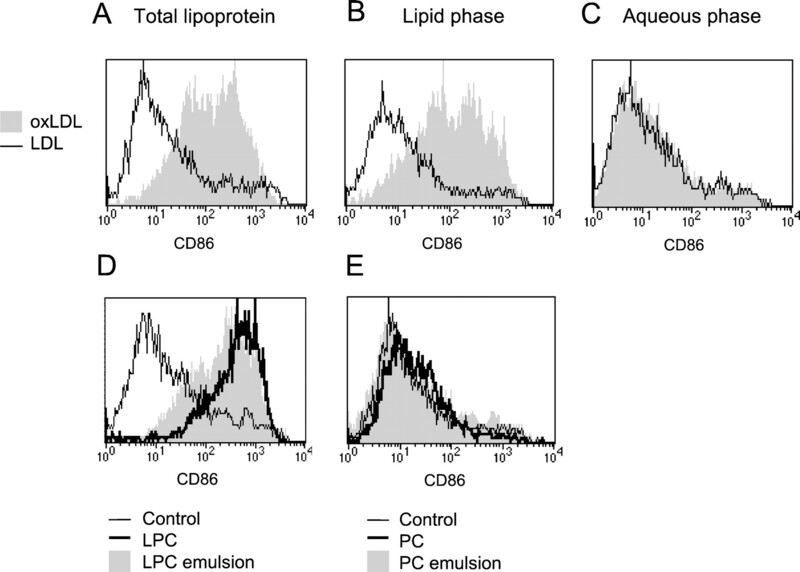 Both LPC and LPC emulsion induced strong up-regulation of CD86 expression, whereas PC and PC emulsion did not (Fig. 1⇓, D and E). CD86 up-regulation by LPC was dose-dependent with optimal induction for 40 μM LPC under these experimental conditions (data not shown). Thus, LPC appeared to be one of the bioactive molecules of oxLDL, and its activity could be vehicled by LDL-like structures. Bioactive molecules contained in the lipid phase of oxLDL. 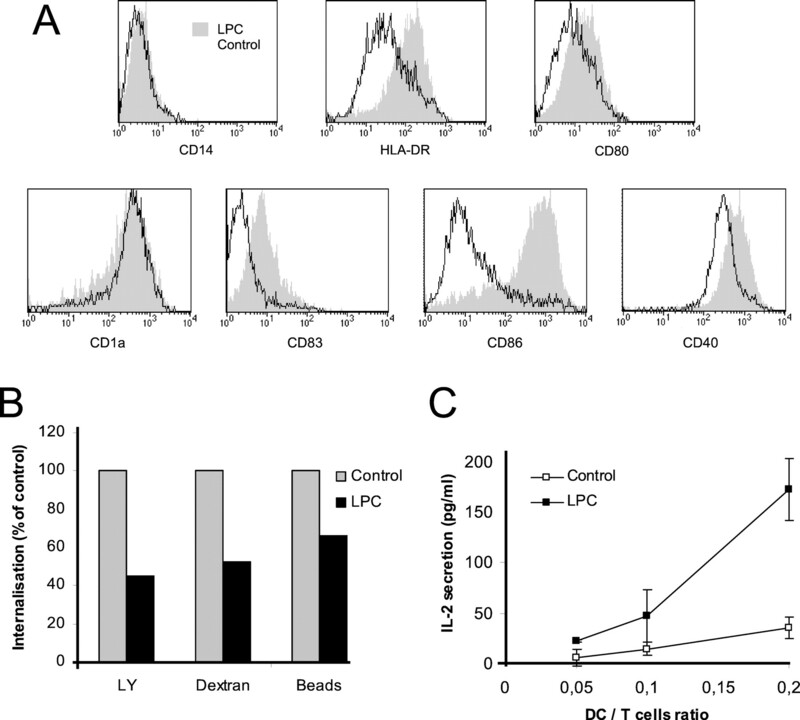 Monocytes were differentiated in LPDS medium containing GM-CSF and IL-4. Cells were treated at day 5 and expression of CD86 was monitored by flow cytometry at day 6. A–C, CD86 up-regulation by lipid phase extracted from oxLDL. A, Cells were treated with 10 μg/ml total native lipoprotein (thin line) or 10 μg/ml total oxidized lipoprotein (filled profile). B and C, Cells were treated with lipid phase (B) or aqueous phase (C) isolated from native LDL (thin line) or from oxLDL (filled profile). D and E, CD86 up-regulation by LPC. Cells were treated with 40 μM LPC (D) or with 40 μM PC (E) solubilized in ethanol (thick line) or emulsified with triglycerides (filled profile). Thin line shows CD86 expression by untreated control cells corresponding to immature DCs. As expected, monocytes differentiated to immature DCs in GM-CSF and IL-4 in the absence of LPC (control) expressed a high level of CD1a but no CD14 and an intermediate level of HLA-DR but no CD80, CD83, or CD86 (Fig. 2⇓A). Cells treated with LPC up-regulated HLA-DR, CD83, CD86, and CD40, but CD80 was only weakly induced. CD14 was not expressed, but CD1a remained high as it did after oxLDL treatment (11). Thus, LPC treatment of differentiating monocytes induced phenotypical characteristics of mature DCs. Cell mortality measured by incorporation of propidium iodide was not increased by LPC treatment (data not shown). Mature DC generation induced by LPC. Monocytes were differentiated in LPDS medium supplemented with GM-CSF and IL-4, with or without LPC (40 μM) added at day 5. Cells were harvested and analyzed at day 6. A, Phenotype of LPC-treated cells (filled profiles) or untreated control cells (thin line). B, Reduced endocytic activity of LPC-treated cells. Cells were incubated at 37°C with 1 mg/ml Lucifer Yellow (LY) or FITC-dextran for 30 min or with fluorescent beads for 3 h. The amount of probe internalized was measured by flow cytometry. Mean fluorescent intensities of one representative experiment of three were normalized at 100% uptake in untreated control cells. C, Allogeneic T cell stimulation by LPC-treated cells. Differentiating monocytes were treated or not by LPC at day 5 for 24 h, washed, and cultured with allogeneic T cells (2 × 105/well) at ratios ranging between 1:5 and 1:20 (DC:T cells) for 4 days. The amount of IL-2 in the supernatants of the coculture was measured by sandwich ELISA. Reduced ability to capture exogenous Ags is an early event of DC maturation (31, 32). Therefore, the internalization capacities of LPC-treated cells were analyzed by flow cytometry using specific fluorescent probes. Lucifer Yellow was used to measure nonspecific fluid phase pinocytosis, FITC-dextran for mannose receptor-mediated endocytosis, and fluorescent beads for macropinocytosis. As shown in Fig. 2⇑B, LPC-treated cells show a significant decrease in their endocytosis activities compared with untreated cells corresponding to immature DCs (from 30% reduction for macropinocytosis to 50% for pinocytosis and receptor-mediated endocytosis). The capacity to stimulate allogeneic T cells is another characteristic of mature DCs. Therefore, the functional properties of LPC-treated cells were further investigated in MLR. In contrast to control untreated cells (immature DCs), LPC-treated cells could activate allogeneic naive T cells inducing the release of IL-2 (Fig. 2⇑C). Thus, addition of LPC during the late stage of monocyte differentiation gave rise directly to mature DCs supporting allogeneic T cell stimulation. It has been recently shown that LPC is a high affinity ligand for G2A receptor expressed on lymphocytes (25). LPC can also bind with low affinity to GPR4 receptor, which has a wider expression (28). Partial sensitivity to PAFR antagonists indicated that some LPC effects could be mediated by the PAFR in various cell types (33, 34). Finally, LOX-1, the lectin-like oxLDL receptor that belongs to the scavenger receptor family, can mediate LPC-induced oxLDL uptake in smooth muscle cells (35). Expression of these LPC receptors was tested by RT-PCR. Total mRNA was extracted from freshly isolated human monocytes, from differentiating monocytes at day 5, and from immature DCs at day 6 of culture in GM-CSF and IL-4. Total mRNA was also extracted when differentiating monocytes were treated at day 5 with 40 μM LPC for 24 h. RT-PCR amplification yielded a DNA fragment of the expected size for G2A, PAFR, and GPR4 in undifferentiated monocytes as well as in differentiating monocytes at day 5 and in immature DCs at day 6 (Fig. 3⇓A). mRNA levels of G2A, PAFR, and GPR4 remained constant throughout the differentiation and were unchanged by LPC treatment. In contrast, LOX-1 mRNA was undetectable in undifferentiated monocytes but was present at day 5 of differentiation and in immature DCs. Although quantitative RT-PCR was not performed, LOX-1 mRNA seemed to be further induced by LPC treatment (Fig. 3⇓A). A, Expression of G2A, PAFR, GPR4, and LOX-1 in monocytes and DCs. Lane 1, Undifferentiated monocytes; lane 2, differentiating monocytes at day 5; lane 3, differentiating monocytes at day 6 (corresponding to immature DCs); lane 4, differentiating monocytes treated with 40 μM LPC at day 5 and harvested at day 6. B, Involvement of G protein-coupled receptors in CD86 up-regulation by LPC. PTX, Differentiating monocytes at day 5 were treated for 3 h with PTX (100 ng/ml) and analyzed at day 6. LPC, Differentiating monocytes at day 5 were treated with 40 μM LPC for 24 h. At day 6, mean fluorescence intensity of CD86 was normalized at 100%. LPC + PTX, Differentiating monocytes at day 5 were preteated for 3 h with PTX (100 ng/ml) before treatment with 40 μM LPC for 24 h. Means ± SD of three independent experiments are shown. C, Involvement of the PAFR in LPC-induced CD86 expression. BN52021, Differentiating monocytes at day 5 were treated with the PAFR antagonist BN52021 (100 μM) and analyzed at day 6. LPC, Differentiating monocytes at day 5 were treated with 40 μM LPC for 24 h. At day 6, mean fluorescence intensity of CD86 was normalized at 100%. LPC + BN52021, Differentiating monocytes at day 5 were treated with 40 μM LPC for 24 h in presence of the PAFR antagonist BN52021 (100 μM). Means ± SD of three independent experiments are shown. D, Time course of ERK phosphorylation induced by LPC. Day 5 differentiating monocytes were treated with LPC (40 μM) for the indicated period of time. 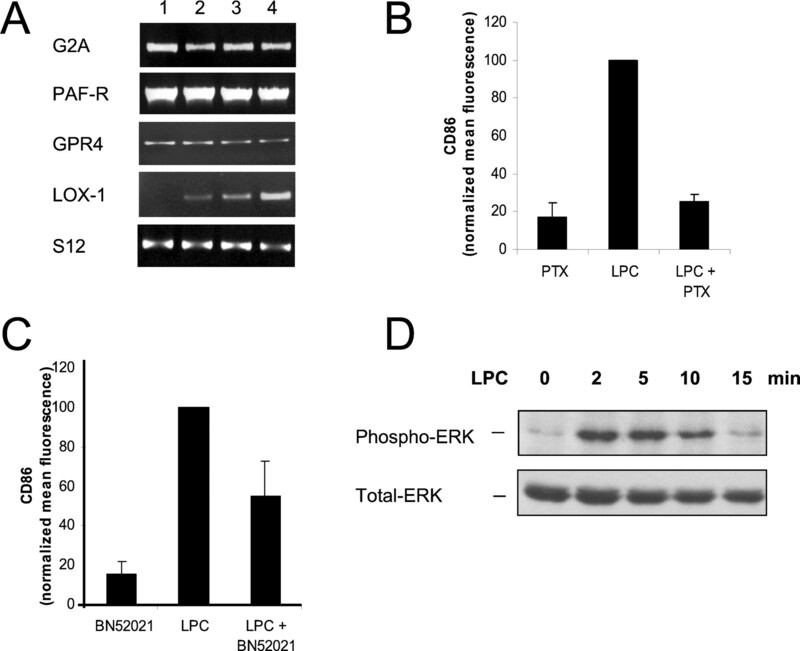 Phosphorylated ERK (phospho-ERK) and total-ERK were detected by Western blot analysis of cell lysates. G2A, GPR4, and PAFR belong to the G protein-coupled receptor family. Gαi proteins are sensitive to PTX, which blocks Gαi-coupled signaling. Fig. 3⇑B shows that up-regulation of CD86 by LPC was totally inhibited when cells were preincubated with 100 ng/ml PTX for 3 h. Other phenotypical modifications induced by LPC treatment and shown in Fig. 2⇑A were also inhibited by PTX (data not shown). These data indicated that all LPC activity was mediated through G protein-coupled receptors, therefore excluding scavenger receptors like LOX-1. Fig. 3⇑C shows that up-regulation of CD86 by LPC was reduced by 40% when cells were preincubated for 15 min with the PAFR antagonist BN52021 before stimulation with LPC. No specific antagonist for G2A or GPR4 is currently available, but it has been shown that phosphorylation of the ERK upon LPC treatment was dependent on G2A or GPR4 expression (25). As shown in Fig. 3⇑D, Western blot analysis of differentiating monocytes exposed to LPC at day 5 revealed a strong and transient increase in phospho-ERK occurring within 2 min after LPC adjunction and decreasing rapidly to return to its basal level after 15 min. The ability of maturing DCs to initiate Th1-type vs Th2-type responses depends on the microenvironmental conditions of their development. The question of to what extent the inflammatory mediators oxLDL and LPC polarize Th cell development was addressed by analyzing the cytokines secreted by allogeneic naive T cells in MLR. Fig. 4⇓ shows that both oxLDL- and LPC-treated cells stimulated the production of IFN-γ by T cells, whereas no IL-4 could be detected (data not shown). This indicated that oxLDL and LPC may instruct DC to initiate Th1-biased responses. 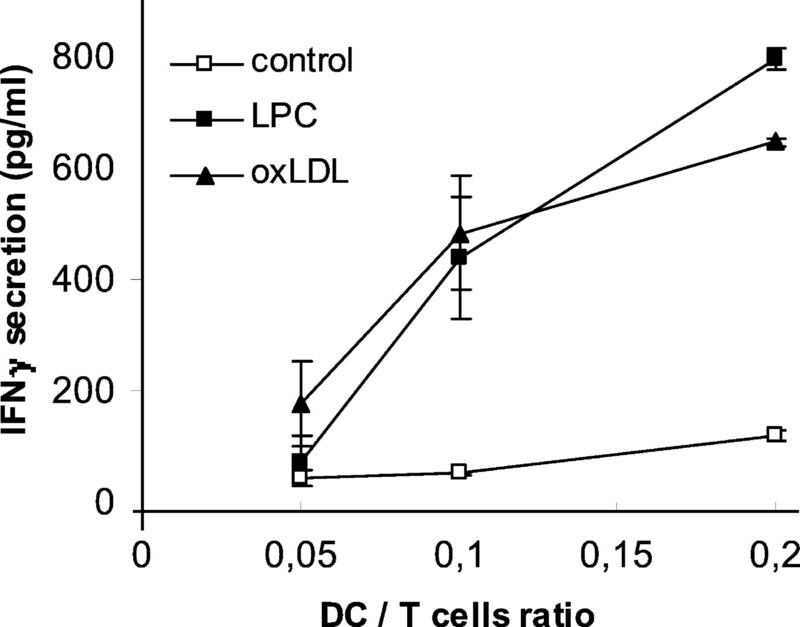 OxLDL- and LPC-treated cells induced a Th1-biased response. Differentiating cells were treated or not (control) at day 5 with 10 μg/ml oxLDL or 40 μM LPC. Cells were harvested at day 6, washed, and cultured in triplicate with allogeneic purified T cells (2 × 105/well) at ratios ranging between 1:5 and 1:20 (DC:T cells) for 4 days. The amount of IFN-γ in the supernatants of coculture was measured by sandwich ELISA. Results of one representative experiment of three. LPC can reach high concentration (100 μM) in the serum of healthy individuals (36). Because LPC can also be present in albumin and lipoprotein-bound forms (37), the functionally available concentration of LPC is difficult to investigate. However, it is likely that endogenous inhibitors present in the serum protect circulating monocytes from the proinflammatory activities of LPC. We have previously shown that native LDL can antagonize DC maturation induced by oxLDL (11). Thus, we compared the phenotype and allostimulatory ability of DCs obtained after oxLDL or LPC treatment in the presence or absence of purified native LDL (50 μg/ml). Composition of purified LDL is shown in Table III⇓. In the presence of native LDL, both oxLDL- and LPC-induced CD86 up-regulation were strongly inhibited (73 and 87%, respectively) (Table II⇓). Inhibition of DC maturation correlated with the inhibition of DC ability to stimulate IFN-γ secretion by allogeneic T cells. Therefore, as for oxLDL, native LDL is an endogenous inhibitor of LPC. To understand how native LDL can block LPC and oxLDL, native LDLs were replaced by Intralipid. Intralipid is a lipid emulsion currently used for parenteral nutrition in humans. It is composed of large particles of triglycerides and phospholipids that contain no protein (Table III⇓). This emulsion strongly antagonized the phenotypic and functional maturation of DCs induced by LPC or oxLDL, strongly inhibiting CD86 up-regulation and IFN-γ secretion by allogeneic T cells (Table II⇑). This suggests that lipid composition of native LDL may determine its inhibitory potential. Growing lines of evidence suggest that oxidation of lipoproteins is a critical event of inflammation and host response to infection (6, 8, 38, 39). We have shown recently that oxLDL promotes mature DC transition from differentiating monocytes (11) and postulated that modification of lipoprotein composition may be a hitherto unrecognized control mechanism linking innate to adaptive immunity. To characterize the active components within the oxidized LDL, the particles were separated into aqueous and lipid phase. The strong effect elicited by the lipid phase led us to test the effect of LPC, one of the major components of oxLDL. The data demonstrate that LPC-treated differentiating monocytes display phenotypical and functional properties of mature DCs. Their internalization capacities are reduced, whereas they can efficiently stimulate allogeneic T cells and IFN-γ production. Thus, LPC is one of the oxLDL components that can promote mature DC generation. IFN-γ production during T-DC interaction indicated that LPC is a Th1-promoting innate stimulus. Our preliminary data have shown that IL-12 p70 secretion is induced by LPC, a process that can be inhibited by an excess of native LDL (data not shown). Compared with other type of stimulus like LPS, production of IL-12 p70 is low but significant, suggesting a role for other cytokines. In this context, IL-18 is of particular interest because it has been shown to synergize with IL-12 to enhance IFN-γ production (40, 41). Additional work is required to clarify the relative contribution of various cytokines to the activation of T lymphocytes by LPC-generated DCs. Although LPC is an important lipid mediator of inflammation, its initial mechanism of action is still poorly understood. GPR4 and G2A, respectively low and high affinity receptors for LPC, have recently been described (25, 28). In addition to these two receptors, LPC action through the PAFR and LOX-1 has also been suggested (33, 34, 35, 42). LOX-1 is a scavenger receptor with a role in defense against Gram+ and Gram− bacteria (43). However, this receptor could be excluded because experiments using PTX as an inhibitor of Gαi showed that LPC action was mediated through a G protein-coupled receptor. The PAFR is strongly implicated in inflammatory reaction and is directly stimulated by lipoteichoic acid, a Gram-positive cell wall component (44). The PAFR antagonist BN52021 partially inhibited LPC action, indicating that this receptor is involved in LPC action. Our preliminary data suggest that this pathway may not be the initiator of LPC effect but may rather amplify LPC action through other receptors (F. Coutant, unpublished data). There is no specific inhibitor or blocking Ab for GPR4 or G2A. However, it has been shown that ERK MAP kinase activation by LPC was dependent on GPR4 or G2A expression (25). Here we confirmed that LPC treatment of differentiating monocytes resulted in ERK activation, therefore strengthening the involvement of GPR4 or G2A in LPC-induced DC maturation. Further studies are needed to address the possible functional redundancy or complementarity among these three receptors. It is tempting to speculate on the role of lysophospholipid receptors and LPC in the control of innate and adaptive immunity. LPC appears to favor the Ag-specific response by promoting mature DC generation. LPC also appears to increase the threshold for proliferation and activation of T cells (25). Therefore, it is reasonable to assume that the highly controlled release of LPC could be one mechanism to improve efficiency and safety of immunity by increasing Ag presentation to naive T cells but limiting the extent of the response and avoiding nonspecific activation of lymphocytes. The high concentration of serum LPC (up to 100 μM) during homeostasis suggests that the proinflammatory activities of LPC are blocked by circulating activators. Albumin appears to be one of these inhibitors as it binds to LPC and decreases some of its effects in vitro. Our results shown in Table II⇑ indicate that native LDL is another inhibitor of LPC explaining why LPC is more efficient in LPDS than in FCS. Inhibition of LPC by native LDL can be mimicked by Intralipid, a stable emulsion of triglycerides and phospholipids. Although the inhibition of LPC by Intralipid remains to be further addressed, this supports the notion that the ratio of phospholipids to lysophospholipids in the direct environment of DCs may influence its maturation. Intralipid is used as a source of energy to avoid wasting during septic shock. Our data suggest that it may also help to limit inflammation. Sensing the danger is a crucial function of APCs, especially for DCs that become activated and initiate primary immune responses (45, 46). DCs can be activated by exogenous pathogen-derived molecules or endogenous signals released by cells that are stressed, infected, or necrotic (47, 48). Our data suggest that oxidation of lipoproteins and production of LPC may be one inducible endogenous signal of danger that is released during the APR. The concentration of albumin drops during the APR, whereas oxidation of native LDL is actively promoted. As a consequence, the concentration of LPC is increased, whereas its two inhibitors are rendered less effective. Thus, the functionally available concentration of LPC is tightly controlled by the acute phase reactants in response to tissue injury. How DCs and T cells integrate LPC signal through a family of G protein-coupled receptors to promote the initiation of an immune response while limiting the extent of the response may thus be a major issue for the understanding and control of inflammatory and autoimmune diseases. Besides the basic research observation that LPC promotes development of mature DCs, the data presented in this study may have practical implications in the field of cell therapy. Moreover, identification of blocking molecules in Intralipid and native LDL may prove valuable for the design of lipid nanoemulsions with anti-inflammatory properties. We thank Anne-Kim Isnard for technical assistance. ↵1 This work was supported by the Agence Nationale de Recherche sur le Sida (Grant HC EP 05), Institut National de la Santé et de la Recherche Médicale, and bioMérieux SA. F.C. is a recipient of an Agence Nationale de Recherche sur le Sida doctoral scholarship. S.A. is a recipient of a Ligue Nationale Française contre le Cancer doctoral scholarship. L.P.-C. is a recipient of a bioMérieux SA postdoctoral fellowship. ↵3 Abbreviations used in this paper: APR, acute phase response; LDL, low density lipoprotein; HDL, high density lipoprotein; oxLDL, oxidized LDL; DC, dendritic cell; LPC, lysophosphatidylcholine; MDA, malonyl-dialdehyde; PC, phosphatidylcholine; LPDS, lipoprotein-deficient serum; PTX, pertussis toxin; PAFR, platelet-activating factor receptor; GPR4, G-protein-coupled receptor 4; LOX-1, lectin-like oxLDL receptor; ERK, extracellular signal-regulated kinase.